The hinge that can store a full-sized pen is a winner. With the latest crop of Inspiron 7000 2-in-1 Black Edition laptops, Dell is bringing some true innovation to its high-end consumer line. Introduced at CES Tuesday morning, these specially designed versions feature a neat trick to adjust thermal behaviors to the immediate environment. But the biggest news is the hinge, which doubles as magnetic pen storage. It’s the cleverest solution to pen integration we’ve ever seen, arguably worth waiting (if you’re a pen nerd) until the Black Editions ship in the June/July timeframe. Unfortunately we don’t know the prices yet, nor much about the specs, but we can use the current Inspiron 13 7000 2-in-1 Black Editions as points of reference. The current models start around $1,400. The various current models feature Intel Core processors, a generous 8GB to 16GB of RAM, and up to 512GB PCIe M.2 SSD storage. Why didn’t anyone else think of this before? The Dell Inspiron 7000 2-in-1 Black Edition carves out a garage for the pen in a special hinge. Simple and easy. When Microsoft built pen support into Windows 10, it created a new quandary for PC makers and users alike: where to put the darn thing when you’re not using it. Awkward loops and unreliable magnetic connections are no match for the jumble of the everyday backpack or bag. With most pens costing around $100, losing one truly hurts. 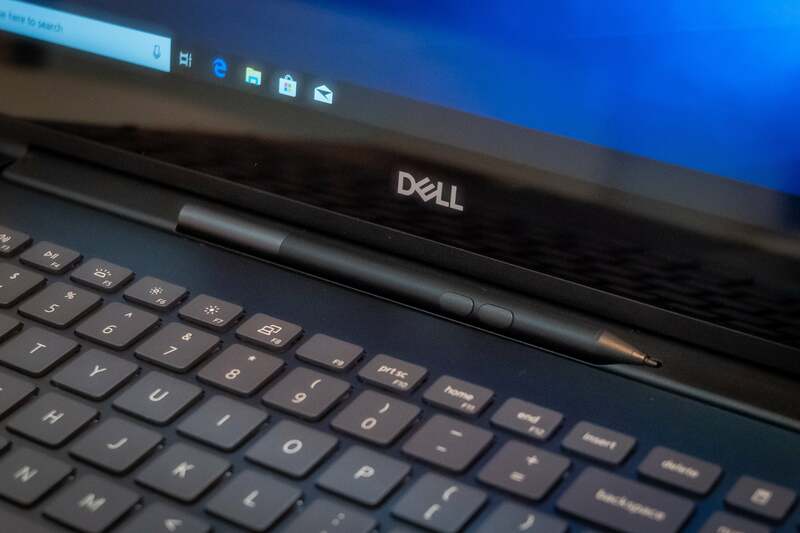 Dell’s solution, built into its Inspiron 13 and 15 7000 Black Edition laptops, hollows out the hinge to make a pen slot. Gentle magnets hold the pen in place. The pen is accessible from any position of the 2-in-1 design, and it’s completely protected when the laptop is closed. The design so perfectly addresses the problem that you wonder why no one else figured it out earlier. According to the company, however, perfection didn’t come easily. The engineers had to figure out how to reroute cables running from the base to the display lid, and have patents pending on their design. There’s one more notable improvement: Adaptive Thermal Technology. As noted before, 2-in-1 laptops have a hard time expelling heat because of their design. Dell’s adaptive technology can sense your position as you use the devices, and adjust its heat output accordingly. This basically means it’ll do its best not to roast your thighs, but it’ll be able to loosen up a bit if it’s on a work surface. Color us impressed and intrigued, but only real-world usage will tell. We’ll be sure to assign our most careless and easily burned editors to test the Inspiron 7000 2-in-1 Black Edition when it ships.